Dr Ailise Bulfin is a medical humanities Research Fellow in the School of Medicine at Trinity College Dublin, currently working on the project ‘Catalysing Neurohumanities research into Child Sexual Abuse’. A literary and cultural scholar, her work ranges from nineteenth-century to contemporary literature and explores the dark side of the human imagination, with a particular focus on representations of catastrophe, war and trauma. 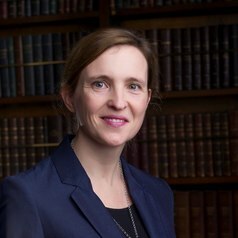 She took her PhD at Trinity College Dublin, funded by an Irish Research Council Postgraduate Scholarship, and subsequently held an Irish Research Council Postdoctoral Fellowship there. She has published a number of critical essays on such topics as gothic fiction, xenophobia, invasion scares, natural catastrophe and climate change, and her monograph, entitled Gothic Invasions: Imperialism, War and Fin-de-Siècle Popular Fiction 1890-1914, is due out in April 2018. Her current research focuses on representations of child sexual abuse in nineteenth century and contemporary culture, and she is co-organiser of an interdisciplinary seminar series on child sexual abuse which has brought together researchers, clinicians, survivors and authors in a wide-ranging conversation to plan new research in this area. Her work has been funded by the Irish Research Council, Royal Irish Academy and the Wellcome Trust.